Whether you’re a Stanford fan or a Razorbacks fan, this herringbone quilt is perfect for you (or your little one). A modern geometric design combined with a simple color palette was the formula for this toddler quilt and it turned out to be amazing! And we now have a herringbone quilt pattern available in our shop! We stayed true to these schools’ colors with this quilt! No variations, no patchwork. We were really worried that the quilt would be “boring.” But it’s anything but that! The pattern is contemporary yet classic. We added extra quilting by first stitching in the ditch and then ½” on either side. We did the same for the horizontal intersections. We quilted in white thread so you can really see how good the quilting looks on the back of the quilt. We have listed this finished quilt and its custom order listing in our shop. This quilt is 44” x 48” – it would be amazing to see this one as a twin size. We can imagine this quilt fitting in at a college dorm since it’s not “baby-ish.” Keep this in mind if you like the quilt and need it bigger – or in a different color. We can do that for you! Head over to our shop and check this quilt’s custom listing out – we would love to create a quilt just for you or for a loved one. But for now, this quilt will be a perfect play mat, toddler quilt, lap quilt or stadium quilt for a Razorback or Cardinal fan. We really enjoyed taking a little patchwork break and deviating from the norm. 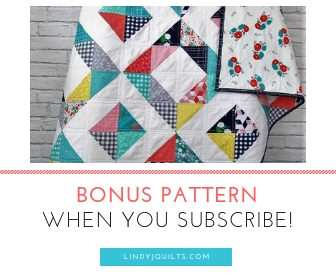 That’s the beauty of quilting – you can break rules, follow rules – you really can’t go wrong! Hope you’re having a nice week – check back in a few days. On Friday we will be revealing the fabrics of our next project.